Sotheby’s London hosted a pair of auctions on Thursday evening that raised a combined total of $62 million. 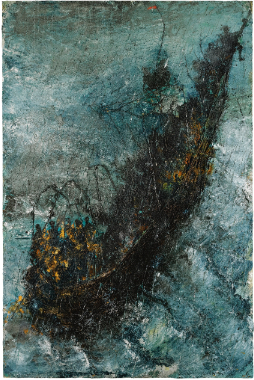 The 20th Century Italian Art sale, comprised of 58 lots, was followed by a 47-lot Contemporary Art sale. The $34 million achieved for the Italian auction was the highest total for an auction in this category, while the Contemporary sale fell just short of its $30 million low estimate. The mixed results suggest that there is money to be spent on the most desirable lots and that buyers are not willing to shell out for anything less. The sales progressed amid demonstrations outside the auction house by protestors of the company’s months-long battle with their art handlers in New York. 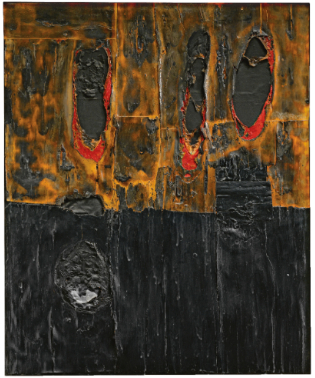 The top three lots at the Italian sale each sold for at least double their high estimates and were led by Alberto Burri‘s Combustione Legno, which set a record for the artist when it sold for $5 million. Of the top three lots at the Contemporary sale, two sold within presale estimates and one was bought in. 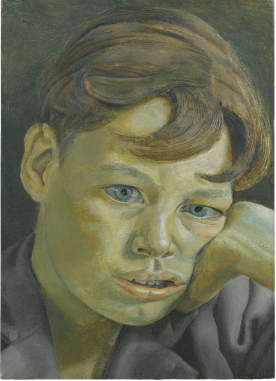 The cover lot – Lucian Freud‘s closely cropped portrait of a young neighbor – just made it past the low estimate once fees were added and was reportedly hammered down after a single telephone bid. The second highest earning lot was Miquel Barceló’s Pluja Contracorrent of 1991, which sold comfortably within presale estimates of $2.2-2.8 million. 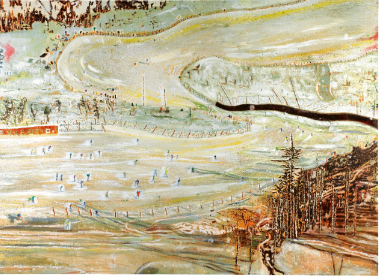 Peter Doig‘s massive Bellevarde, measuring over 9 feet long, was a casualty of the evening. The work last sold at Christie’s in 2001 for $138,000 and was expected to bring as much as $3 million. It was bought in, along with works by Frank Auerbach, Takashi Murakami, Rudolph Stingel, and Glenn Brown. The Contemporary sale was not completely devoid of hot-blooded bidding. As at Phillips the previous night, a work by Jacob Kassay sold for nearly twice its high estimate. 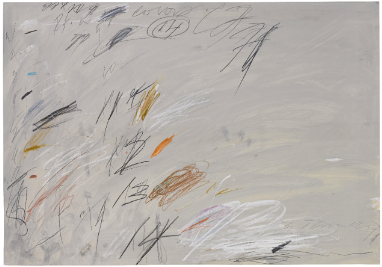 An untitled drawing by Cy Twombly brought in $947,000 against a high estimate of $550,000 when it sold to an unidentified Latin American buyer. 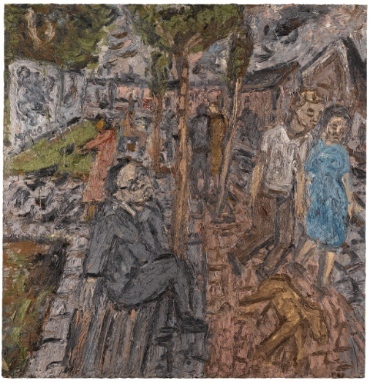 The artist record was set for Leon Kossoff when the British expressionist’s A Street in Willesden sold for $1.1 million. This week’s auction blitz ends tomorrow night at Christie’s London. Check back for results. 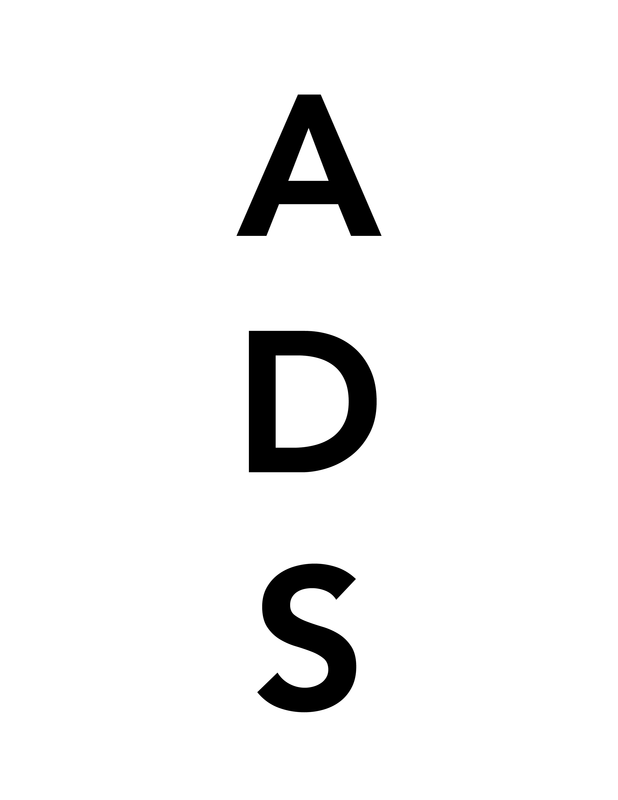 This entry was posted on Friday, October 14th, 2011 at 6:01 am	and is filed under Art News, Auction Results. You can follow any responses to this entry through the RSS 2.0 feed. You can leave a response, or trackback from your own site.